Just about everyone has a fear of something: the dark, water, flying—lions and tigers and bears, oh my! For me, it’s heights. Yes, I’m afraid of bugs too, but I doubt I would ever fall to my death off an insect. I found out I was afraid of heights under stressful circumstances. The day started out pleasantly enough. 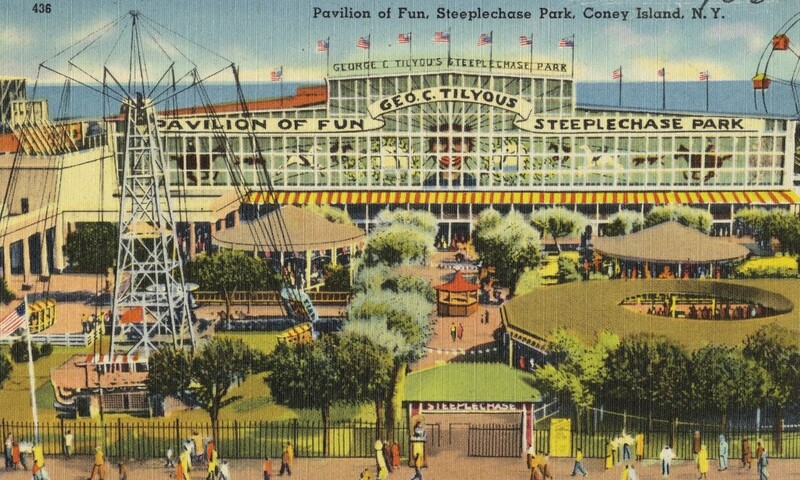 My mom and dad took my Baby Sister and me to Coney Island’s Steeplechase Park. I was twelve and Baby Sis was seven. 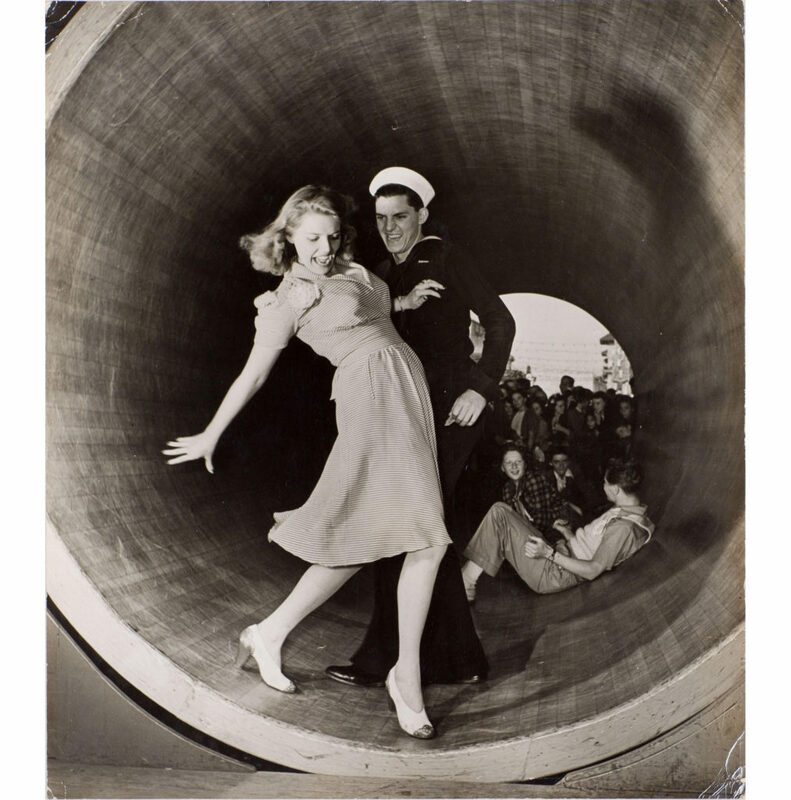 We entered the Pavilion of Fun through the Barrel of Fun, a revolving cylinder that challenged one’s equilibrium. 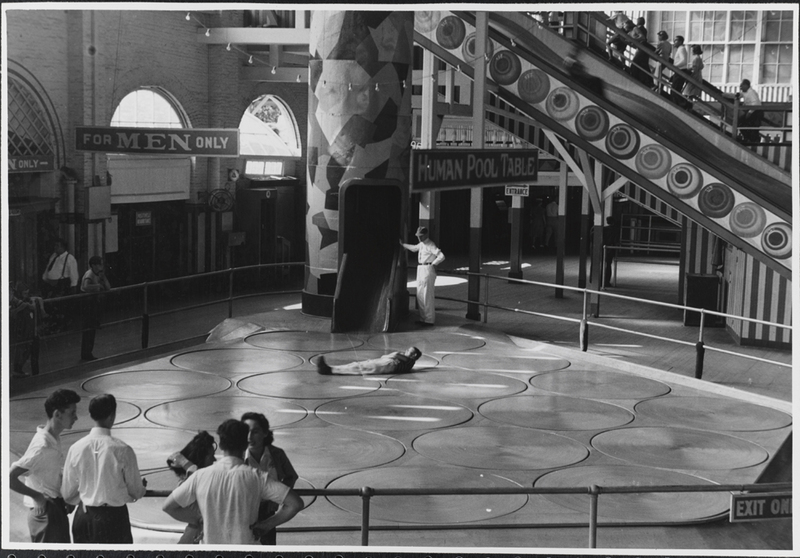 We went on some classic indoor rides: The Human Roulette Wheel, The Giant Slide, and The Human Pool Table. 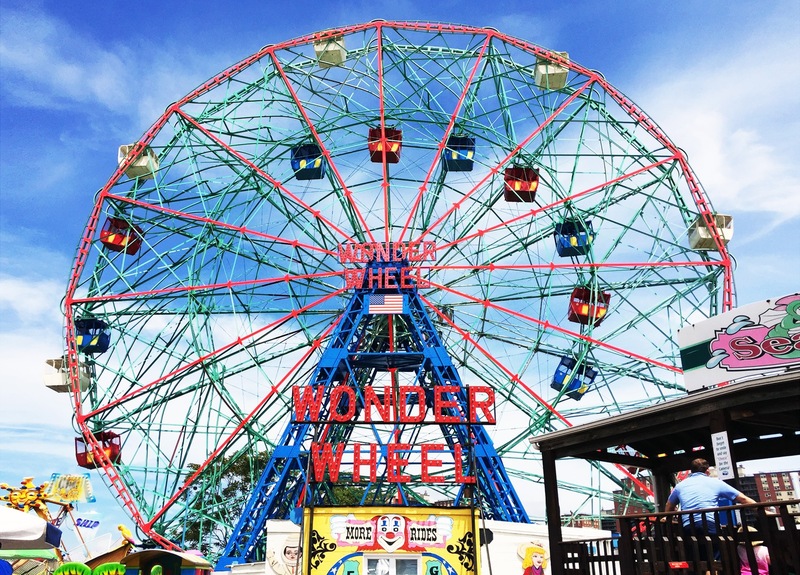 Outdoors we went on The Caterpillar, The Wonder Wheel Ferris Wheel, and the Steeplechase mechanical horse race. 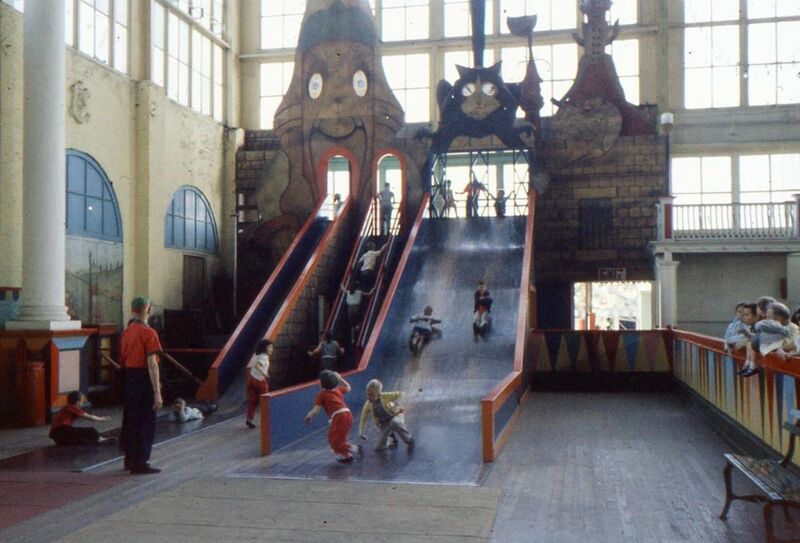 Riders mounted four life-size mechanical horses and raced on a track that circled the Pavilion of Fun. 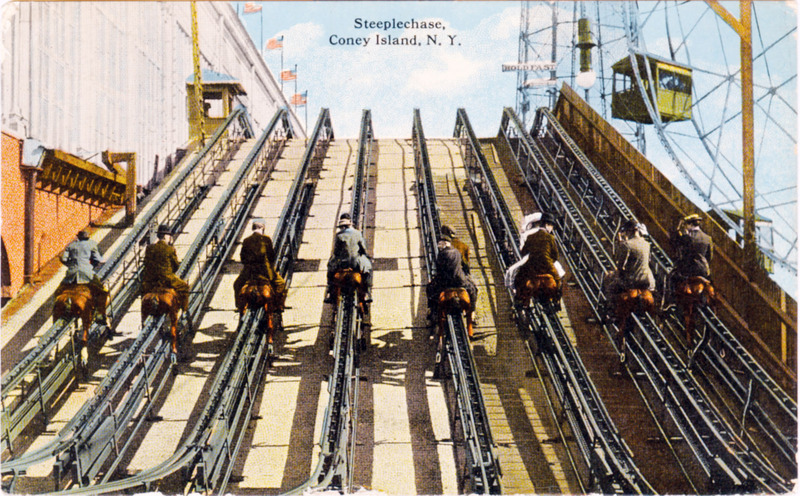 The Steeplechase race was the best ride of all. We were too little to ride the Cyclone roller coaster, so my dad managed to talk us into going on the Parachute Drop instead. 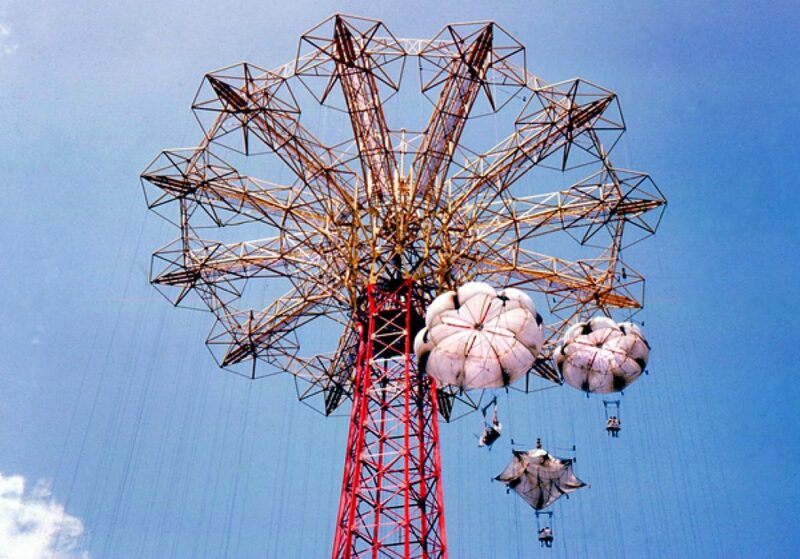 The Parachute Drop was a six-sided steel tower 262 feet high with twelve drop points. Each parachute had a seat for two that hung beneath it. Riders were lifted by cables to the top of the tower where the chutes were released, opened, and down the riders floated. The ride to the top took about a minute. 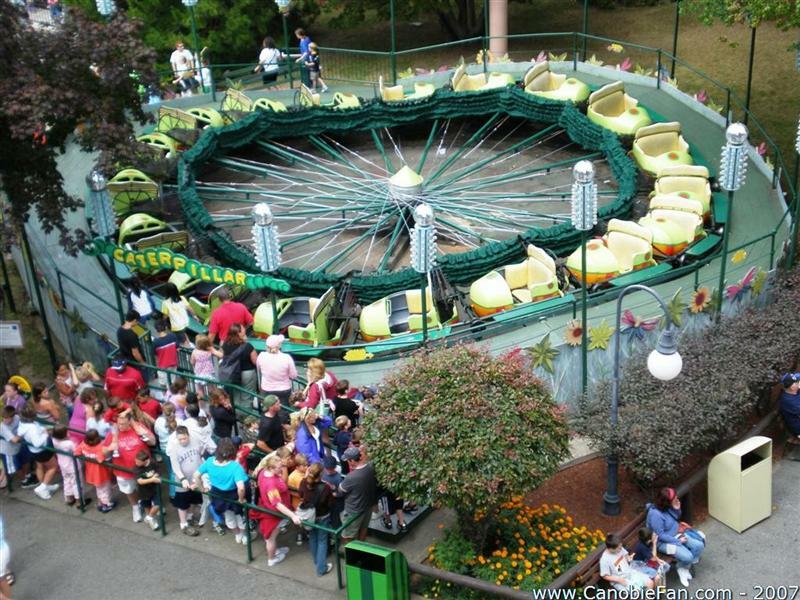 The drop lasted about fifteen to twenty seconds. Piece of cake, our dad assured us. Baby Sis and I climbed onto our seat and were secured by a safety bar across the front. Up we went—and up we stayed. The other riders’ parachutes opened and down they dropped. Ours did not. After a bit, I noticed that no one else was getting on the ride. No more parachutes were ascending. The ride had shut down. A quick look around made it clear that there was no emergency exit up in the air. Baby Sis and I were sitting on the only way out. I looked down to see our dad talking to the ride operator. That was when I discovered I didn’t particularly care for heights. It was a long way down, and I started feeling kind of queasy and very anxious. Our mom was waving at us and yelling. She was trying to tell us that everything would be all right, but we couldn’t make out what she was saying at the time. Baby Sis was really scared and started crying. I was scared and wanted to cry too, but I couldn’t. I was the Big Sister. I confess that I didn’t feel very brave, but I knew I had to be for my younger sibling. That’s what Big Sisters do. I put my arm around Baby Sis, looked her in the eyes and lied like crazy. If we ever got back down, I knew for sure that I would have to go to confession because I really stretched the truth. Everything was okay, I said. Daddy would make sure they unstuck our parachute right away, I said. We’ll be going back down any minute, I said. Nope. We remained up at the top for what seemed an eternity. 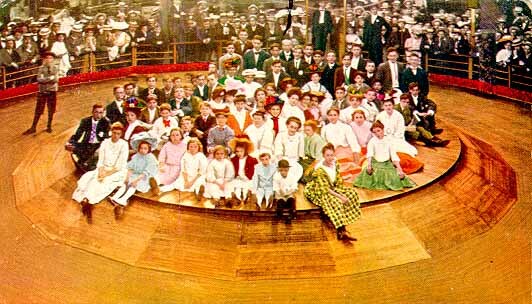 I recently found a mention of the incident in an online history of Steeplechase Park. I had no idea anyone had recorded our Parachute Drop from Hell. While little was new at the park, operations at the park weren’t exactly uneventful. 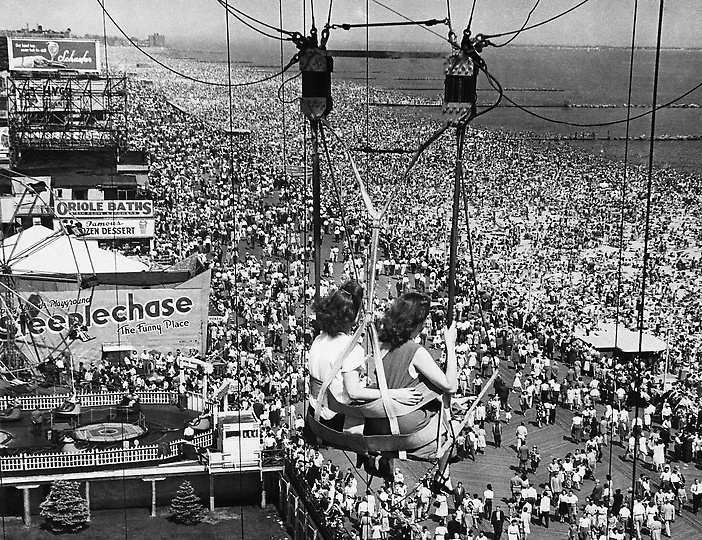 The Steeplechase Pier burned down at 3:15 A.M. on April 22, 1955, and two patrons were stuck 30 feet above the ground on the Parachute Drop for 27 minutes on August 6th. They sent two men up to the top via another parachute to fix the jammed mechanism from above. I have to quibble with the accuracy of the height above the ground. We were stuck at the top, our parachute failed to release and open, and that was way more than 30 feet above the ground. The time we were up there sounds about right. It just seemed a lot longer than 27 minutes to Baby Sis and me. Our parachute released with a jolt we weren’t expecting. We both screamed. We screamed all the long way down. When we reached bottom, we started crying. We didn’t stop crying until we got home where we felt safe again. Ever since that time, both Baby Sis and I dislike heights, and neither of us feels safe flying. Given a choice, we’d rather drive. Darn that Parachute Drop. I’m afraid of heights without an experience such as yours. So glad your results were positive. Seems like there have been a lot of midway accidents lately. Those midway accidents are scary. 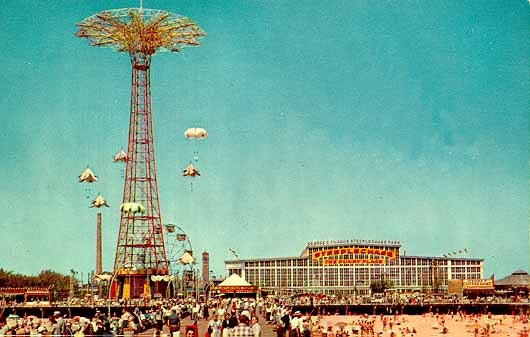 As far as I know, ours was the only incident of the Parachute Drop malfunctioning. My sister and I were lucky that the chute’s mechanism was simply stuck. It could have been worse. The chute could have broken loose from the cable and my sister and I could have plunged to the ground. That thought seriously bothered me. I had falling dreams for years afterward. And that is why I don’t like those rides! But hey, you’re famous! I don’t care for heights either, and yet we’ll be driving through the mountains next week. But at least there you have the good ole earth under your feet. Fun post, though I’m sure it wasn’t fun for you at the time. Heights are my worst nightmare too, though I can’t point to a specific event. Sounds horribly scary. One way to achieve your fifteen minutes of fame. Thanks for the entertainment. The mention didn’t include our names or ages. 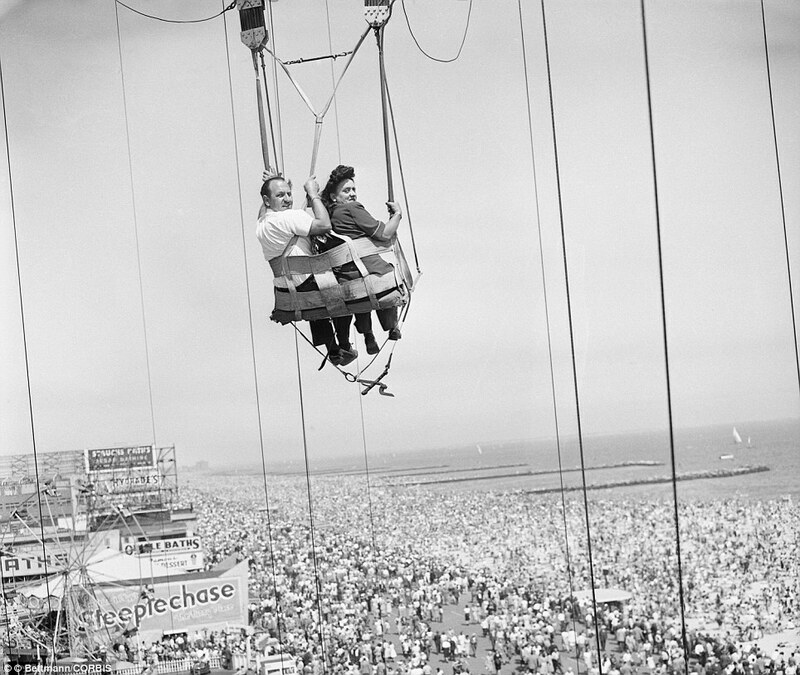 I suspect that at the time it occurred the park management didn’t want it known that they marooned two little girls up in the air on the Parachute Drop. There was a death on one of their other rides. They gave the office address to cover their hind ends so the report made it appeared it took place outside the park.